Back to School…Am I Ready? Lots of families are ready to get back into a routine and send children back to school in the month of August. Some of the children are excited and ready, but are you? It’s a time of year when no matter how old you are, the time is ripe for a fresh start. An early childhood program may follow a school year format where a new cycle of lessons start. You may have new families and children beginning in your program for the first time. Some children may be transitioning into a new classroom. Be Organized. Having your ducks in a row is good for you and good for your students. Making sure that everything and everyone has a place helps the flow of the day go smoothly. Prepping materials ahead of time for the sorting, storage, display, and accessibility will also help children get to the tasks and work they have to do with ease. Move some furniture if you have to! Everyone will be happy. Manage the Classroom. Your room can look awesome with every bit of organized labeling and decor. If you do not have a positive behavior management plan ready, it may be a rough start to the school year. Every student, class, and room is different. Children spend a lot of time at the beginning of the year learning the rules of the classroom. Just make sure you have a plan and stick to it to ensure that you, the kids, and parents know how things will go. Develop Family Relationships. Making kind and welcoming connections with parents from day one will not only benefit the children in your care, but yourself! It builds trust between you and the parent when you make yourself accessible and available to discuss things about the year in a positive way. Know the Community. Making relationships in the community benefits everyone in your program. Inviting community to be guest speakers, meeting people from organizations that can help families in need, and creating classroom projects to help the community are all great examples of how building those relationships can be a good thing for all! Involve the Students in Planning! I have said it before in previous blogs… Taking time to listen to the children in your care and let them help you plan activities for how they want to learn something will make it a fun school year! Building on the children’s interests is always a good idea to keep them wanting to come to your program. With the start date getting closer and closer each day, keeping these strategies in mind will help pave the way for a great year for both you and the children in your program. This entry was posted in Best Practice, Preschool, teachers and tagged back to school, classroom decoration, classroom tips on August 21, 2017 by Bridget Jackson. Play is essential to children as eating and breathing. Hundreds of books and articles have been written for teachers and parents on the importance of playing with children. There’s no doubt about it, playing with children is important, but there are also some things it doesn’t mean. For example, it doesn’t mean you have to make playtime something that must be done on schedule, like brushing your teeth or cleaning up the classroom at 11:45 every day. The minute you think you have to play with children you risk turning play into work. Children pick up on those feelings, of course, and fun becomes less and less of a possibility for both of you. It’s best to play with the children in your care when you’re relaxed and interested, not when you have to force yourself or make it so much of a routine. On days when you’re out-of-sorts or tired, help the children in your classroom get started on something. Then take a minute to observe the environment and the children as they interact with other children. Sometimes what children really want is a feeling of being connected with you. Responding with specific comment and eye contact when the children show you something can provide that comfort. It doesn’t mean you have to constantly plan new activities. Let children become comfortable with the environment and enjoy some of their favorite activities that have been introduced within the classroom. Have you ever painstakingly organized materials for a craft project and then discovered that the children are totally uninterested? It can make you feel like you’ve been left holding the short end of the stick. (And, what’s worse, the stick is probably dripping with glue!) Sometimes it’s fun to enjoy a special activity and plan. That is what teachers do best. Consider what a child’s day is like when they attend an all day program or have been on the run all week with busy parents. Sometimes, children like predictable, ordinary play with familiar toys. It doesn’t mean you’re responsible for preventing boredom. In fact, a little experience with boredom can be invaluable. Children are often busy with school, scheduled activities, and play dates. How often do they get to set their own agenda or figure out their own pace? It’s true that boredom can make them uncomfortable, but it can also nudge them into developing some planning and decision making skills. Boredom can give children an opportunity to learn how to entertain themselves, be open to possibilities and to find out what they really like to do. It doesn’t mean that you as a teacher must always play with them. It’s true that playing with children can help them acquire new skills, but so can playing alone. Playing alone can also be the foundation for creativity, for understanding new ideas, or for recreating an experience through pretend play. Children need some time to play things out on their own without anyone else interpreting or guiding the outcome. Being available to respond or lend a hand when asked, can be just as important to children as being actively involved in their play. 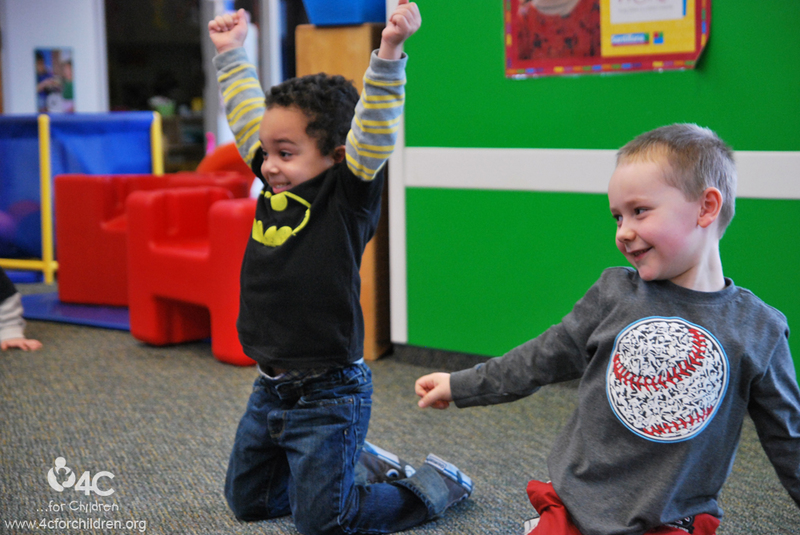 This entry was posted in Best Practice, learning through play and tagged classroom tips, early childhood educators on April 30, 2014 by 4cforchildren.